ITS TRUE...THE EARLY BIRD CATCHES THE WORM! Minutes to Downtown yet COUNTY TAXES ONLY! UNDER CONSTRUCTION...Get a sneak preview of this Ron Marsh Custom Home at The Canyons! 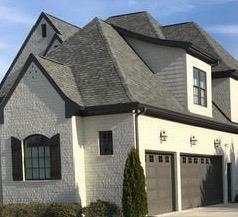 Ron's reputation has been meticulously built with each and every custom home we've sold! Ron spares no cost to deliver an above-the-competition home to his clients as can be seen in the many homes he's built in The Enclave. We wanted you to have a chance to put your finishing touches on the home and so allowances in place for features you can choose at this ''early'' stage. 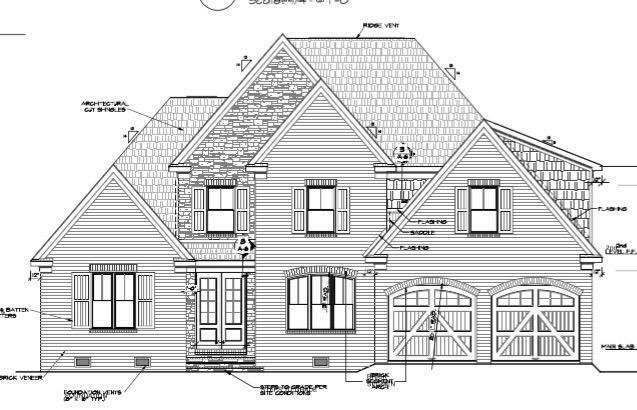 Don't let the brick color fool you if you drive by...those 3 sides will have a brush of white paint to compliment the beautiful stone slated for this residence. (see photo of color scheme for this home) Aside from the brick and stone -the architectural shingles and cedar accents including shutters and arched garage doors and future landscape will give this home A+ CURB APPEAL!.Other great exterior perks include sod back and front, sprinkler system back and front, large covered porch in back, additional driveway on side for extra parking, large private lot with beautiful backyard and mature wooded area at the back of the lot. The garage has one bay that is extra deep for your extended cab truck. You'll appreciate that this home is on a crawl space...NO Slab! This elegant, sought after--3500 SF, 5-6 Bedroom/4 Bath open floor plan is designed with flexible family spaces. The oversized, double arched. front doors gracefully welcome your visitors to the blue ribbon interior with amenities found in homes at a much higher price point. Enjoy wide plank flooring, gas heat on main, gas cooktop, double ovens, microwave farm sink, custom tiled backslash, upgraded white cabinetry, granite, large island, large pantry, laundry room with separate exterior entrance, detailed trim work, shiplap fireplace surround with cedar mantle gas fireplace in great room with beamed ceiling. The kitchen is an integral part of the great room making family time and entertaining a snap. There will be plenty of serving space at the oversized breakfast bar and lots of table space in the adjoining breakfast room with lovely backyard views. The formal dining room is an intimate space meant for regular use or family gatherings. There are TWO bedrooms on the MAIN level! The Master, with its many windows and double trey ceiling opens up to a large walk-in closet and linen, and is lavishly appointed with a semi-circular custom designed tiled shower with two entry points, as well as a free standing tub. The built-in vanities are much wider than you'd think and therefore have lots of additional storage. The second bedroom on the MAIN level is perfect for an aging parent, nursery or home office and is just next to the full hall bath. The second floor has an additional 3 or 4 bedrooms depending on how you intend to use the space. There is a jack and jill bath accompanies two of the large bedrooms and one bedroom has a private full bath. Last but not least is the Bonus/6th bedroom. Its a generous space that would make a great playroom for the kids, family theatre or additional bedroom. Secondary bedrooms also have walk-in or double closets. The 2nd floor bathrooms will have granite counters. Ron has made excellent use of EVERY sf! 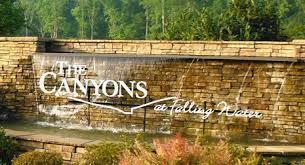 The Canyons is a very desirable location - lower Hixson (with No City Taxes) and just minutes to downtown! Its close to Erlanger, Sisken, Childrens' Hospital, Drs. offices, and medical facilities. Its equally convenient to shopping, dining, schools, golf and tennis, marina's and boat launches and lots of great parks. Downtown Chattanooga is the heartbeat of Hamilton County and offers many annual events and a plethora of attractions including the world famous Riverbend! This nearby neighborhood is nestled below Signal Mountain boasting beautiful year round mountain vistas with stunning seasonal views. 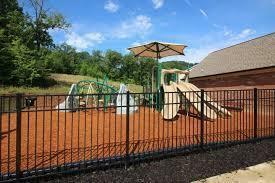 The Canyons is mostly level which is great for walking and the centrally located playground and community pool are a great way for families to make friendships. NOW IS THE TIME TO BUY THIS HOME I ORDER TO TAKE ADVANTAGE OF YOUR PERSONAL CUSTOM SELECTIONS! Why buy a cookie cutter!!! If unmatched quality, custom construction, affordable pricing and accessibility are important, then welcome to your new home at 437 Canyon Springs! The builder is always happy to meet with anyone serious about purchasing this home. PLEASE NOTE: This home is under construction and workers are present! Please do not enter without an appointment with me or your agent! Thank you so much for your cooperation.